Received September 27, 2018; Revised October 26, 2018; Accepted October 30, 2018. Information on biochemical changes following rapid transfusion of blood mixtures in liver transplantation patients is limited. A blood mixture composed of red blood cells, fresh frozen plasma, and 0.9% saline was prepared in a ratio of 1 unit:1 unit:250 ml. During massive hemorrhage, 300 ml of the blood mixture was repeatedly transfused. A blood mixture sample as well as pre- and post-transfusion arterial blood samples were collected at the first, third, fifth, and seventh bolus transfusions. Changes in pH, hematocrit, electrolytes, and glucose were measured with a point-of-care analyzer. The biochemical changes were described, and the factors driving the changes were sought through linear mixed effects analysis. A total of 120 blood samples from 10 recipients were examined. Potassium and sodium levels became normalized during preservation. Biochemical changes in the blood mixture were significantly related to the duration of blood bank storage and reservoir preservation (average R2 = 0.41). Acute acidosis and hypocalcemia requiring immediate correction occurred with each transfusion. Both the pre-transfusion value of the patient and the blood mixture value were significant predictors of post-transfusion changes in the body (average R2 = 0.87); however, the former was more crucial. Rapid infusion of blood mixture is relatively safe because favorable biochemical changes occur during storage in the reservoir, and the composition of the blood mixture has little effect on the body during rapid transfusion in liver recipients. However, acute hypocalcemia and acidosis requiring immediate correction occurred frequently due to limited citrate metabolism in the liver recipients. Massive hemorrhage is common during the dissection period of liver transplantation. The current anesthetic guidelines for liver transplantation emphasize the importance of preparing large amounts of blood products in order to cope with acute and massive hemorrhage . Because standard transfusion methods are not suitable for rapid warming and infusion, a rapid infusion device with a reservoir is recommended for massive transfusion. The three-liter reservoir of the rapid infusion device is usually filled with a mixture of packed red blood cells (RBC), fresh frozen plasma (FFP), and 0.9% saline in a ratio of 1 unit, 1 unit, and 200–250 ml, respectively, to constitute 25–30% hematocrit . Using a rapid infusion device and an appropriate blood mixture, the intravascular volume, hematocrit, and proper coagulation can be more easily maintained. Anesthesia-related problems that can occur during massive transfusions include acute complications such as hypothermia, hyperkalemia, metabolic acidosis, and hypocalcemia. The frequencies of these complications are closely related to the rate of blood transfusion, patient characteristics, and biochemical characteristics of the blood products. A liver transplant recipient may be particularly vulnerable to these adverse effects for a variety of reasons. Citrate in the blood product is metabolized more slowly due to decreased liver function, which results in more severe acidosis and hypocalcemia [3,4]. The use of irradiated RBCs to reduce graft-versus-host reactions can lead to an increased potassium concentration, which can worsen hyperkalemia . Massive transfusion of saline-mixed blood can lead to a rapid increase in plasma sodium concentration, exacerbating central pontine myelinolysis in a chronic hyponatremia patient . Previous reports on complications related to massive transfusion have mostly focused on the use of unadulterated packed RBCs. In addition, there is currently limited information regarding the biochemical changes of blood mixture in the reservoir of the rapid infuser, as well as their effects in liver transplantation patients . This study was designed to assess the risk associated with rapid transfusion of blood mixtures. The primary goal of this study is to describe the biochemical changes in the blood mixture during rapid transfusion in liver transplantation recipients. The secondary goal is to investigate the factors related to these biochemical changes. This prospective observational study was approved by our Institutional Review Board (H-1012-063-344) and registered with the publicly accessible clinical trial registration site, clinicaltrials.gov (NCT01448343). Written informed consent was obtained from patients or their families at the preoperative visit. Adult liver transplantation recipients were screened for eligibility. Exclusion criteria were: prominent cardiac dysfunction (right heart failure, pulmonary hypertension, coronary artery disease, and severe dysrhythmia), renal failure, and ongoing electrolyte imbalance. Patients whose preoperative hematocrit was more than 30% or whose intraoperative transfusion requirement was expected to be less than one reservoir volume (3,000 ml) were excluded during the study. Patients arrived in the operating room without premedication. Anesthesia was induced with 100 μg of fentanyl, 1.5–2 mg/kg of propofol, and 1 mg/kg of rocuronium. Following tracheal intubation, mechanical ventilation was adjusted so as to maintain an end-tidal carbon dioxide tension of 35–40 mmHg. Arterial lines were inserted into the radial and femoral arteries for frequent blood sampling and the continuous monitoring of arterial pressure, respectively. A triple lumen Swan-Ganz introducer (Advanced venous access, AVA®, Edwards Lifesciences LLC, USA) and Swan-Ganz catheter were inserted into the right internal jugular vein. Anesthesia was maintained with sevoflurane, oxygen, and air. Cisatracurium was continuously administered so as to provide adequate muscle relaxation. During laparotomy, the attending surgeon evaluated surgical risk factors, including fragile intraperitoneal vessels; excessive collateral veins; deeply located hepatic vein; and adhesions due to previous liver resection, cancer invasion, or spontaneous bacterial peritonitis. If the surgical risk of bleeding was considered to be significant, or if the preoperative hemoglobin was less than 10 g/dl, a Fluid Management System (FMS, FMS2000®, Belmont Instrument Corporation, USA), a rapid infusion device with a 3 L reservoir, was prepared and filled with the blood mixture prior to the hepatic resection. The blood mixture consisted of 4 units of leukocyte depleted and irradiated RBC, 4 units of FFP, and 1,000 ml of 0.9% saline. According to a quality control report from the National Blood Bank, one unit of leukocyte depleted RBC has a volume of 303 ± 11 ml and a hematocrit of 57 ± 3%, while one unit of FFP has a volume of 170 ± 16 ml. Therefore, the estimated volume and hematocrit of the blood mixture were 2,584–2,800 ml and 22.5–29.2%, respectively. The criterion for rapid transfusion was a low hematocrit level (< 30%) with an acute reduction in intravascular volume (> 300 ml). Transfusions were performed by administering a 300 ml bolus at a rate of 500 ml/min using the FMS. Seven or eight boluses can be administered from one prefilled reservoir. Blood mixture samples were collected from the side port of the FMS infusion line during the first, third, fifth, and seventh bolus transfusions. Pre- and post-transfusion arterial blood samples were taken before and after each bolus transfusion. The blood pH, hematocrit, and concentrations of potassium, sodium, ionized calcium, and glucose were immediately evaluated by a point-of-care analyzer (GEM Premier 3000, Instrumentation Laboratory Company, USA) in the operating room. The elapsed time from the initial preparation of blood mixture to each bolus transfusion was measured. During the study period, hypotension (over a 20% reduction of mean arterial pressure compared to baseline blood pressure) was treated with 5–10 mg of ephedrine or 10 μg of epinephrine. Abnormal parameters were corrected immediately after evaluating the post-transfusion values. Sodium bicarbonate was injected when the arterial pH was less than 7.25 and accompanied by a base deficit greater than 10 mM/L. If the ionized calcium was lower than 1.0 mM/L, either 300 or 600 mg of calcium chloride was administered. Acute hyperkalemia (serum potassium level > 6.5 mM/L) was treated with an immediate infusion of insulin and glucose. The sample size calculation was based on our preliminary observations of blood mixture composition. Serial measurements of prefilled blood mixtures suggested that there were time-dependent changes in several variables. According to the preliminary data, detecting the time-dependent changes in four repeated measures of potassium, glucose, and hematocrit required seven, nine, and four patients, respectively, with a type I error of 0.05 and power of 0.8. The maximum sample size of nine was increased to 10 subjects, in anticipation of a dropout rate of 10%. Descriptive statistics were performed on patient and surgical characteristics. The incidences of severe acidosis (pH < 7.20), hypocalcemia (ionized calcium < 0.42 mM/L), hyperkalemia (potassium concentration > 6.5 mM/L), and anemia (hematocrit < 20%) were counted. Uses of rescue drugs during the study period were also recorded. 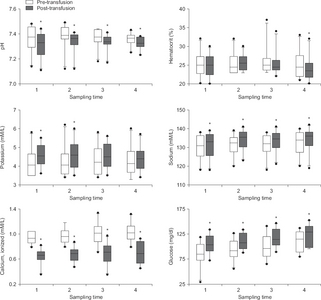 Sequential changes in blood mixture values during four bolus transfusions were assessed by repeated measures analysis of variance and post-hoc multiple comparison with Bonferroni correction. Immediate post-transfusion changes in the body were evaluated using Wilcoxon signed rank tests between pre-transfusion and post-transfusion values. Linear mixed effects regression analysis was conducted to identify the factors contributing to changes in the laboratory values of the blood mixture in the reservoir. The fixed effect variables were the blood bank storage time of RBCs (days) and the time elapsed from blood mixing to transfusion (hours). The dependent variables were pH, hematocrit, potassium, sodium, ionized calcium, and glucose levels of the blood mixture. Linear mixed effect modeling was also performed in order to identify the risk factors of post-transfusion changes in the body. The fixed effect variables were pre-transfusion and blood mixture values. The dependent variables were pH, hematocrit, potassium, sodium, ionized calcium, and glucose levels after transfusion. An auto-regressive variance-covariance structure and random intercept were assumed. Adjusted R2 was calculated using the method described by Nakagawa and Schielzeth . Values are expressed as absolute numbers or mean ± SD (range). A P value < 0.05 was considered to be significant. Sample size calculation was performed using G*power program (http://www.gpower.hhu.de). Statistical analyses were performed using SPSS (version 21, IBM Co., USA) and NCSS 10 (NCSS LLC, USA). A total of 24 patients were evaluated, and 14 patients were excluded from analyses for the following reasons: 10 patients refused to participate in the study; two patients failed to finish the study protocol because their blood loss was less than 1 reservoir volume; and two patients failed to follow the protocol because of excessive bleeding. Ultimately, a total of 10 patients completed the study and were included in analysis. The characteristics of the patients and surgery are described in Table 1. The initial composition of blood mixture measured 33 ± 24 minutes after the blood components were mixed showed low pH (6.85 ± 0.05) and hematocrit (24.4 ± 3.9%) as well as high potassium (11.1 ± 5.2 mM/L) and glucose (325 ± 33 mg/dl) without calcium. Significant changes were observed in the reservoir, such as continuous decreases in hematocrit, potassium, and glucose levels, as well as a steady increase in sodium concentration (P < 0.05) (Fig. 1). Values are expressed as absolute number or mean ± SD (range). Values include amounts administered during study period only. Biochemical changes of the blood mixture in the reservoir. During transfusion, the laboratory values are either consistently low (pH and ionized calcium), steadily decreased (hematocrit, potassium, and glucose), or increased (sodium) in the blood mixture. The concentration of ionized calcium is assumed to be zero because it cannot be measured. *Bonferroni corrected P < 0.05 between values. Significant post-transfusion changes occurred in all parameters (P < 0.05) (Fig. 2). An acute decrease in pH and ionized calcium concentration was observed after transfusion. A significant decrease in hematocrit was observed in the final sample (P = 0.016). In addition, all transfusions instantly increased sodium and glucose levels. A significant increase in potassium concentration was observed in the first half samples as well (P < 0.05). However, all post-transfusion changes were within clinically acceptable ranges, except for the changes in calcium concentrations. Acute biochemical changes in the body during rapid transfusion. Immediate post-transfusion changes are observed in the body during the early (potassium), late (hematocrit), and entire (pH, ionized calcium, sodium and glucose) transfusion periods. *P < 0.05 vs. pre-transfusion value. Linear mixed effect models revealed that the laboratory values of the blood mixture were significantly related to the blood bank preservation days (glucose), reservoir preservation time before transfusion (hematocrit and sodium), or both (pH and potassium) (Table 2). However, the coefficient of determination of the models was small in each parameter (0.23–0.49), suggesting that biochemical changes in the reservoir are less predictable. Furthermore, a linear mixed effects model of post-transfusional changes indicated that the parameter coefficients were much smaller in the blood mixture values than in the pre-transfusion values of the body (Table 3), suggesting that the effect of the composition of the blood mixture on the biochemical changes in the body is minor during the rapid infusion of blood mixture. NS: not significant, NA: not assessible. Calcium concentration of blood mixture was zero. NA: not assessible, NS: not significant. Severe acidosis and hypocalcemia were observed in three out of 40 measurements (in one patient) and two out of 40 measurements (in one patient), respectively. In these cases, 58 ± 78 mEq of sodium bicarbonate and 1,140 ± 369 mg of calcium chloride were administered in order to correct for intraoperative acidosis and hypocalcemia, respectively. No significant hyperkalemia or anemia was observed during the study period. Mean arterial pressure and central venous pressure were maintained adequately (62–95 mmHg and 2–10 mmHg, respectively) without hypoxemia. We evaluated the biochemical changes in the blood mixture prefilled in the FMS reservoir as well as the effect of rapid transfusion of the mixture on the body during adult liver transplantation. The main findings of this study are as follows: 1) low pH, high potassium, and high glucose without calcium were typical features of initial blood mixture, 2) the blood bank storage period and the preservation time in the reservoir could partially explain the compositional change of the blood mixture, 3) post-transfusion changes in patients were less dependent on the composition of blood mixture, and 4) acute metabolic acidosis and hypocalcemia required repeated treatment to maintain normal levels during rapid transfusion. The most serious complications associated with rapid transfusion are hyperkalemia and subsequent cardiac arrest. Potassium concentration in the substrate gradually increases during cold preservation of packed RBC due to the inhibition of sodium-potassium pump activity. The extracellular potassium concentration of stored unit increases at a rate of 2 mM/L per day . Moreover, the potassium levels are much higher in irradiated RBCs that are frequently used in liver transplantation . Due to the relatively small volume of substrate, hyperkalemia due to transfusion of packed RBCs is rare, but rapid transfusion can lead to hyperkalemia, which can in turn lead to fatal arrhythmia or cardiac arrest . Our linear mixed effect model showed that long-term preservation in the blood bank increased potassium concentration, which could be offset by sufficient preservation time in the reservoir. According to our model, it is estimated that the increase in potassium concentration over seven days in the blood bank can be offset by one hour of storage in the reservoir. Moreover, the rapid infusion of 300 ml blood mixture did not cause clinically significant hyperkalemia in patient blood. Our results show that the absolute increase in serum potassium after transfusion was only 1/10 of the potassium concentration of blood mixture. Based on these results, we can assume that the probability of clinically significant hyperkalemia is low during rapid transfusion of blood mixture. However, care must be taken in patients or periods in which the risk of hyperkalemia increases in liver transplantation . Rapid transfusion was associated with significant changes in all variables; however, clinically significant changes requiring immediate and repeatable correction were only observed in serum calcium concentrations and acidosis. Under normal physiologic conditions, critical citrate toxicity is less likely to occur due to the rapid metabolism of citrate through Krebs cycle in the liver and the mobilization of calcium from the internal reservoir of the body. However, patients with end-stage liver disease may develop acute hypocalcemia upon acute administration of citrate-rich blood products, due to improper citrate metabolism. Reduced cardiac contractility and vasodilation are major manifestations associated with acute hypocalcemia, and these can cause hypotension . The spontaneous recovery of hypocalcemia may be delayed or impossible during massive transfusion in patients with liver cirrhosis without calcium supplementation . Our study shows that 300 mg of calcium chloride should be administered each time a 300 ml blood mixture is transfused in order to maintain normal ionized calcium levels and stable arterial pressure. Metabolic acidosis is another adverse effect that requires rapid correction in massive transfusion. Citrate in packed RBC and FFP, lactate and pyruvate caused by RBC metabolism, and loading of large amounts of chloride from the normal saline are the presumed causes of acidosis. In the current study, a decrease in pH was observed after each bolus transfusion of 300 ml blood mixture, and 60 mEq of bicarbonate was required to correct for acidosis. Frequent administration of bicarbonate and ventilation control are essential to maintaining a normal acid-base balance. In addition, the use of plasmalyte or normosol as a mixing fluid may reduce hyperchloremic metabolic acidosis. Changes in sodium and glucose levels in liver recipients require caution. Chronic hyponatremia is common in patients with liver transplantation, but acute correction of hyponatremia during surgery can increase the risk of central pontine myelinolysis . Sodium in the reservoir is constantly increasing over time; however, the post-transfusion sodium level was within the physiologic range and the effect of blood mixture on the body was marginal (P = 0.04). However, the clinical effect of sodium loading should in liver recipients requires further study. Massive transfusion can cause hyperglycemia in liver transplantation, because all currently used blood preservatives include dextrose. Dextrose in CPDA-1 preserved packed RBC reaches 440 mg/dl on the first day of storage, and gradually decreases to 84 mg/dl after 35 days. FFP also contains 535 mg/dl of glucose . Nonetheless, previous clinical studies have failed to demonstrate any relationship between the amount of transfusion and serum glucose level during hepatectomy [14,15]. We also found that one reservoir volume did not cause hyperglycemia after transfusion. Another interesting finding that requires discussion is the change in hematocrit. In the current study, the hematocrit levels steadily decreased as the preservation time in the reservoir passed, failing to achieve a consistent transfusion effect. This is due to the sedimentation of erythrocytes, which occurs in the column of the reservoir at a rate of 12–23 mm/hr during preservation [16,17]. Unlike the initial infusion, the latter infusion contains a mixture with fewer blood cells. Clinicians should aim to visually assess erythrocyte sedimentation and resolve it with repriming or external shaking of the reservoir so as to mix the upper and lower blood mixture layers. There are some limitations in this study. First, our country uses CPDA-1 blood without exception, but other preservatives such as AS-1, AS-3, or AS-5 are currently in use worldwide. For example, 85% of blood products in the US are preserved in AS-1 . AS-1 blood contains more dextrose than CPDA-1 blood, but less citrate. AS-1-stored blood showed a different clinical profile from CPDA-1 blood in terms of glucose homeostasis, hypocalcemia, arterial hypotension, and mortality in a swine model that simulated a massive transfusion condition . Although our results are more meaningful in massive transfusion cases using CPDA-1 preserved blood, the blood mixture of AS-1 blood is presumed to be safer in terms of acute citrate toxicity. Second, this study was performed in a limited number of patients. However, sample size estimation considering repeated measurements seems to have been properly carried out, because significant biochemical changes were observed over time, which was the main purpose of the study. Thirdly, we tested the immediate changes caused by the transfusion of one reservoir volume, and did not confirm any cumulated effect of blood mixture transfusion. Lastly, we did not analyze the overall transfusion related complication rate. Further studies should be conducted to confirm the consequences of using large amounts of blood mixtures. In conclusion, the blood mixture in the reservoir of the FMS has undergone favorable biochemical changes in this study during the preservation period. Acute hypocalcemia and metabolic acidosis required immediate correction, but hyperkalemia, hypernatremia, and hyperglycemia were only potential risks. Considering that the majority of the immediate and cumulative biochemical changes in the body are minimal in the current study, rapid transfusion of the blood mixture by FMS is relatively safe when combined with intensive intraoperative treatment, such as frequent administration of calcium and bicarbonate. This work was solely supported by departmental funding. Yost CS, and Niemann CU. Anesthesia for abdominal organ transplantation. Miller's anesthesia, Miller RD. 7th ed. Philadelphia: Churchill Livingstone; 2009 p. 2155-84. Pinsky MR, Grenuik A, Gordon RD, and Starzl TE. Intensive care of liver transplant patients. Critical Care, Civetta J, Kirby R, and Taylor R. Philadelphia: JB Lippincott Company; 1987. Kramer L, Bauer E, Joukhadar C, Strobl W, Gendo A, and Madl C et al. Citrate pharmacokinetics and metabolism in cirrhotic and noncirrhotic critically ill patients. Crit Care Med 2003;31:2450-5. Chung HS, Cho SJ, and Park CS. 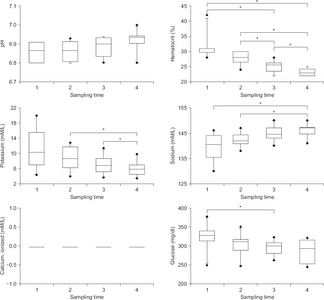 Effects of liver function on ionized hypocalcaemia following rapid blood transfusion. J Int Med Res 2012;40:572-82. Hillyer CD, Tiegerman KO, and Berkman EM. Evaluation of the red cell storage lesion after irradiation in filtered packed red cell units. Transfusion 1991;31:497-9. Abbasoglu O, Goldstein RM, Vodapally MS, Jennings LW, Levy MF, and Husberg BS et al. Liver transplantation in hyponatremic patients with emphasis on central pontine myelinolysis. Clin Transplant 1998;12:263-9. Cronbaugh R, Ploessl J, Sutton R, and Martin M. Evaluation of a rapid infusion system. J Extra Corpor Technol 1994;26:200-4. Nakagawa S, and Schielzeth H. A general and simple method for obtaining R2 from generalized linear mixed-effects models. Methods Ecol Evol 2013;4:133-42. Moore GL, Peck CC, Sohmer PR, and Zuck TF. Some properties of blood stored in anticoagulant CPDA-1 solution. A brief summary. Transfusion 1981;21:135-7. Smith HM, Farrow SJ, Ackerman JD, Stubbs JR, and Sprung J. Cardiac arrests associated with hyperkalemia during red blood cell transfusion: a case series. Anesth Analg 2008;106:1062-9. Xia VW, Ghobrial RM, Du B, Chen T, Hu KQ, and Hiatt JR et al. Predictors of hyperkalemia in the prereperfusion, early postreperfusion, and late postreperfusion periods during adult liver transplantation. Anesth Analg 2007;105:780-5. Morgan JP, Perreault CL, and Morgan KG. The cellular basis of contraction and relaxation in cardiac and vascular smooth muscle. Am Heart J 1991;121:961-8. Ewalenko P, Deloof T, and Peeters J. Composition of fresh frozen plasma. Crit Care Med 1986;14:145-6. Atchison SR, Rettke SR, Fromme GA, Janossy TA, Kunkel SE, and Williamson KR et al. Plasma glucose concentrations during liver transplantation. Mayo Clin Proc 1989;64:241-5. Cheng KW, Chen CL, Cheng YF, Tseng CC, Wang CH, and Chen YS et al. Dextrose in the banked blood products does not seem to affect the blood glucose levels in patients undergoing liver transplantation. World J Gastroenterol 2005;11:2789-91. Miller A, Green M, and Robinson D. Simple rule for calculating normal erythrocyte sedimentation rate. Br Med J (Clin Res Ed) 1983;286:266. Wetteland P, Røger M, Solberg HE, and Iversen OH. Population-based erythrocyte sedimentation rates in 3910 subjectively healthy Norwegian adults. A statistical study based on men and women from the Oslo area. J Intern Med 1996;240:125-31. Miller RD. Transfusion therapy. Miller's anesthesia, Miller RD. 7th ed. Philadelphia: Churchill Livingstone; 2009 p. 1739-93. Buchholz DH, Borgia JF, Ward M, Miripol JE, and Simpson JM. Comparison of Adsol and CPDA-1 blood preservatives during simulated massive resuscitation after hemorrhage in swine. Transfusion 1999;39:998-1004.